I think I'm quite late to the Drops party. 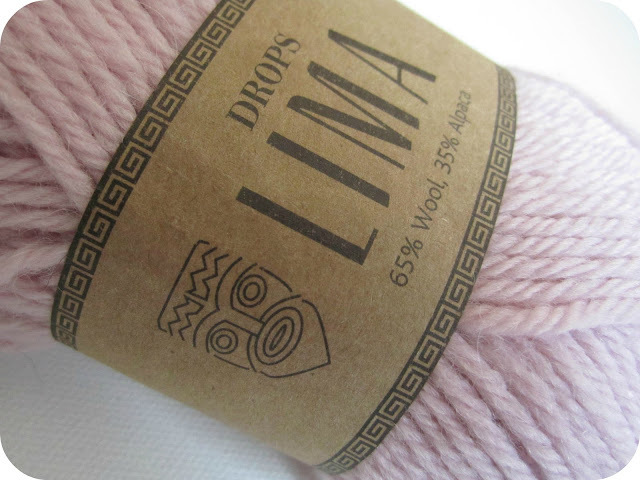 I was shopping around my new favourite yarn website (consistently superb delivery service - my own unbiased opinion) for an inexpensive wool-mix yarn and came across Drops Lima in the loveliest muted shades. "£2.00 a ball?" I thought. "Why not?" I thought and ordered a ball in each of my five favourite colours. Why not indeed? It's lush and I'm a little bit in love with it. 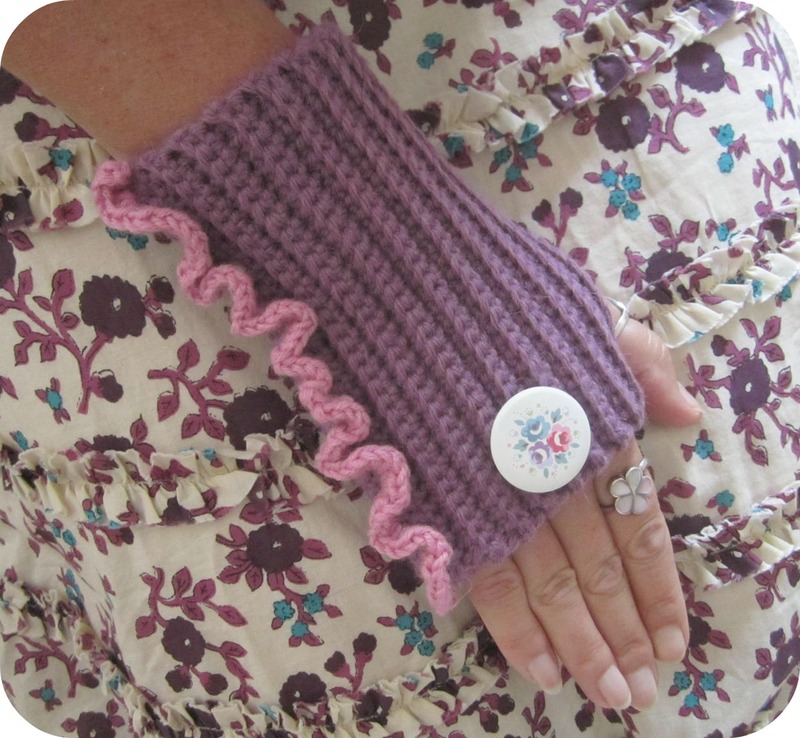 I was dying to have a 'play' so naturally selected my namesake first (Heather) and, it being one of the hottest days of the year, decided to make a pair of easy wrist warmers!!! 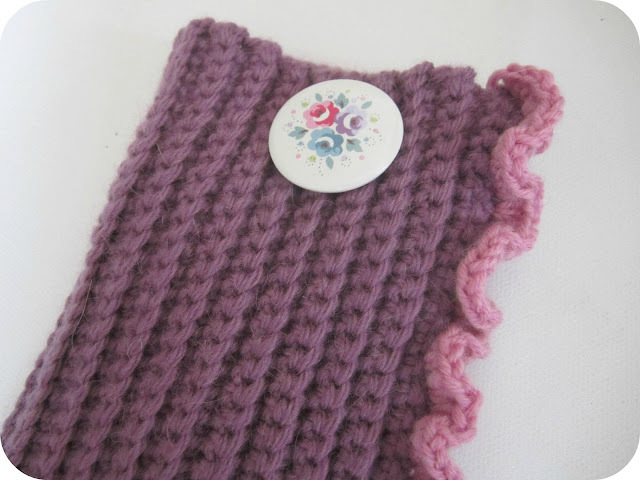 I opted for a simple rib effect which is just plain old double crochet (US single crochet) worked in the back loops only. 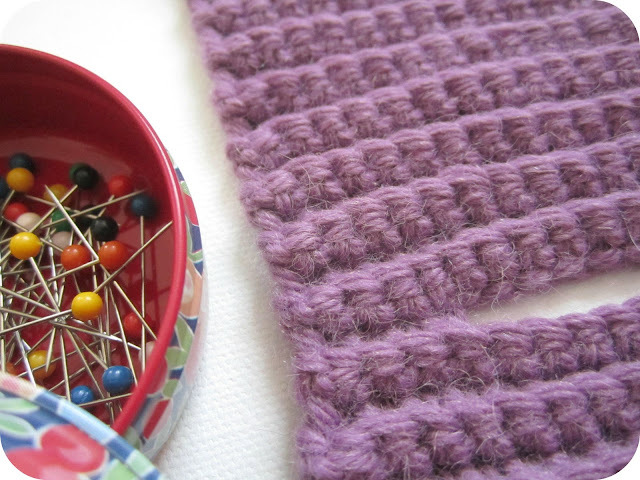 The rib stitch gives quite a lot of stretch to the crochet which I like for wrist warmers - rather than looking too 'tubey', they will stretch with the contours of your hand and wrist. Edited to add : I think the heat got to my brain when I was adding the details to this picture! Firstly, I've used US terminology for some reason (?) 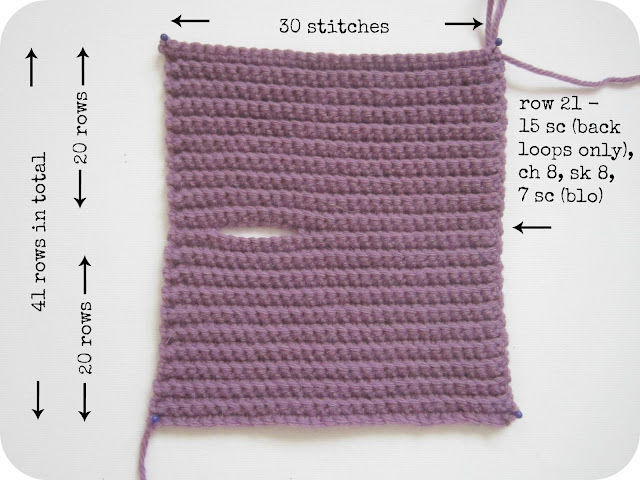 and secondly, I actually double crocheted (in back loops only) 18, chained 8, skipped 8 and double crocheted (blo) 4. Sorry. ... and then, bringing the first row up to meet the final row on each one, double crocheted them together. You could of course slip stitch or sew them - whichever takes your fancy. Rather frustratingly there wasn't quite enough yarn in one ball to complete the pair so I did have to order another. However, I figure they cost about £2.50 in total to make. You could wear them plain or have a little fun decorating them. I was rummaging through my button drawer and came across a little packet of floral Cath Kidston badges. Ooh pretty. Then, because I was in a slightly playful mood, I selected a ball of Debbie Bliss Baby Cashmerino and made a little frill along the joining seam - just three half trebles (US half doubles) in each stitch. I may crochet a frill on the other one, maybe in a different colour, but I may not. Gorgeous colour, if you do another frill how about green? 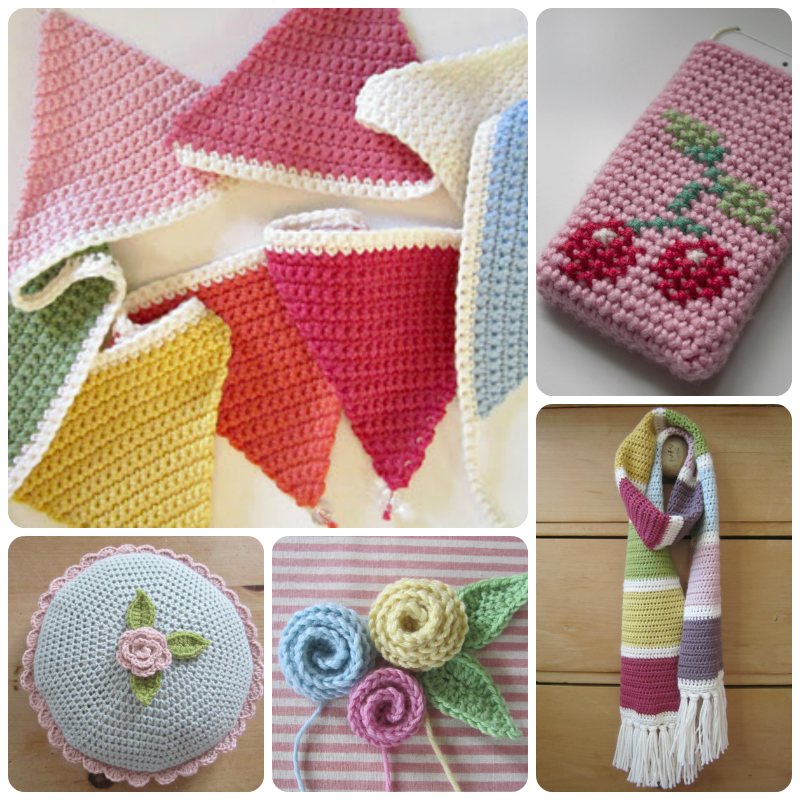 Wish I could crochet. 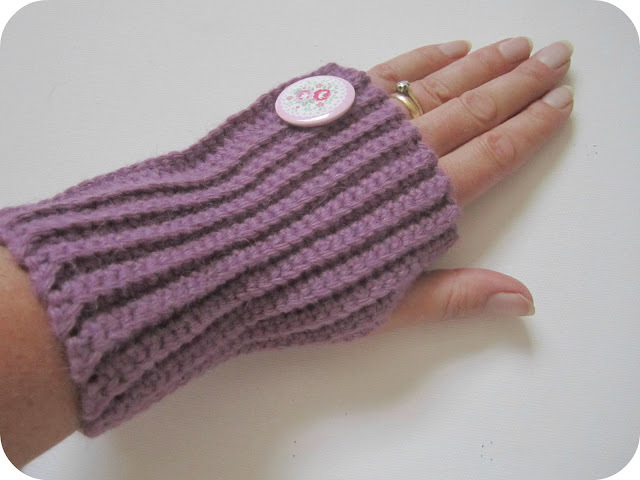 I prefer them without the frill,lovely colour but I personally would add thumbs,its just my own preference but I cant stand wearing them without thumbs. The yarn looks and sounds very beautiful, I will make a note of it! 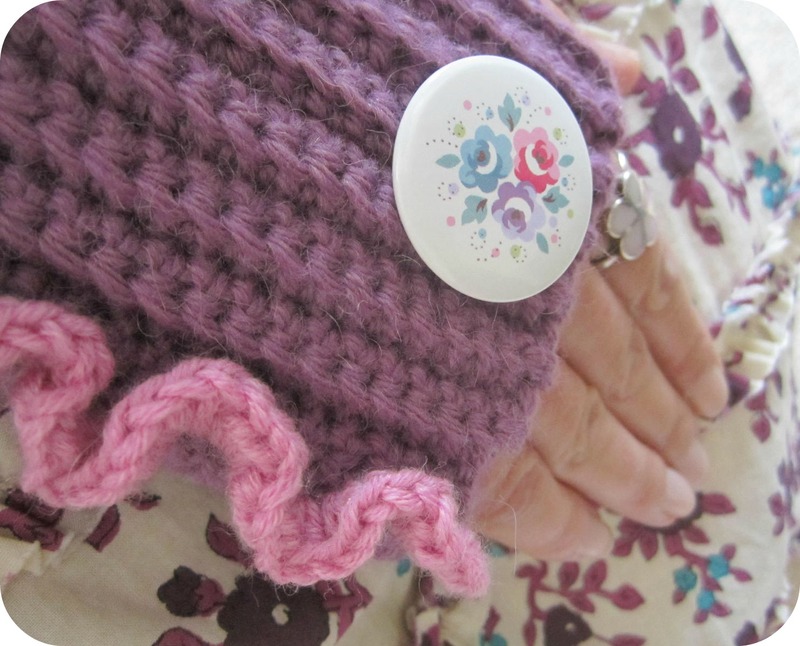 Your wrist warmers are gorgeous, such a pretty shade, and the little frill is adorable, and the cute floral badges are inspired! Ooo I blimmin love these! Am bookmarking this now for an autumn project. Oh Heather, these are so cute!! I love the frill on it. The price of that yarn is really good considering they are not synthetic and it seems really soft. I will have to pop round the yarn website to have a look. I recently bought some cotton yarn from the yvestown shop (check the great blog) as they had a summer sale of 30% and the prices were also a great bargain. ooh they are a beauty. I love Drops too - and their patterns. 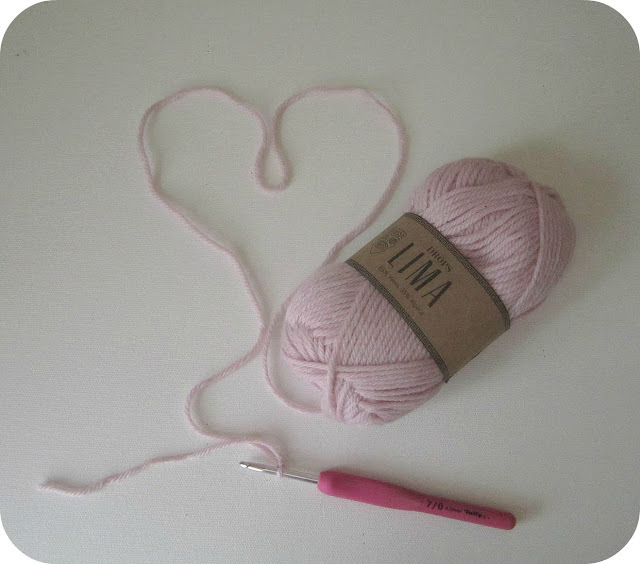 I am in love with the same website and bought some lima a few weeks ago I also love the Drops Paris which is a 100% cotton and a crazy price of £1.25 - I just ordered a load more today. Hope you have a fun holiday and love your friends apple brooch - so talented. 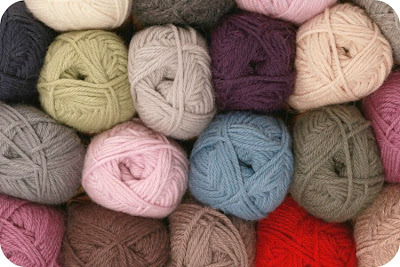 That yarn looks gorgeous, I love the soft muted colours you have chosen. Your writs warmers are so lovely, I like them with the little frill and CK badge, so pretty. Thank you for sharing how you made them. These are TOO DARN CUTE!!!!! Love these, the frill especially! I must try the Lima, to date I've only used Drops alpaca yarns. 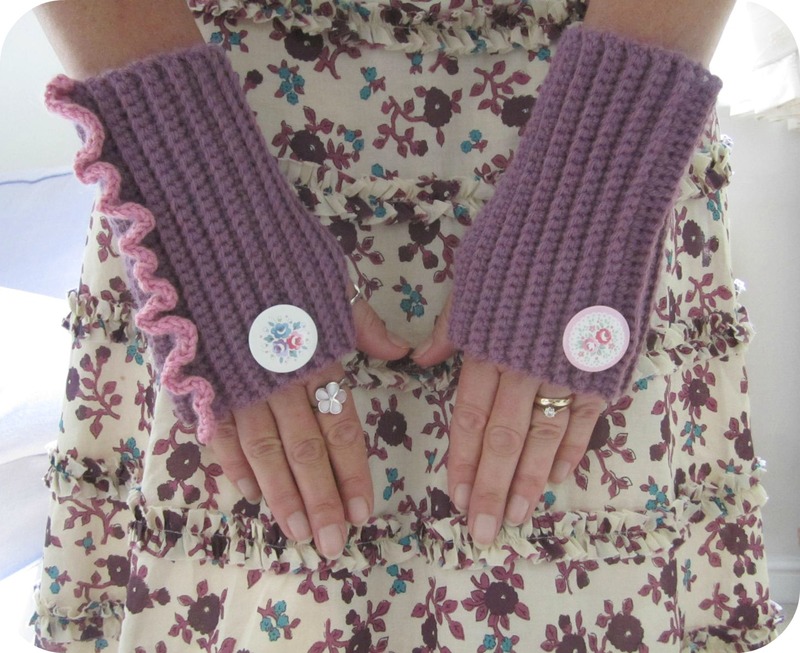 I just love your simple, but prettily effective, wrist warmers. Thank you so much for sharing your pattern! They've come just in time for the cooler temperatures! Love the ruffle and the colours you chose! Ruffles in different colours would be really fun! Hi! I love your wrist warmers. Very sweet, and I love the frill and the pretty, flowery, brooch-like thing. Its so lovely, but I can't remember the word. 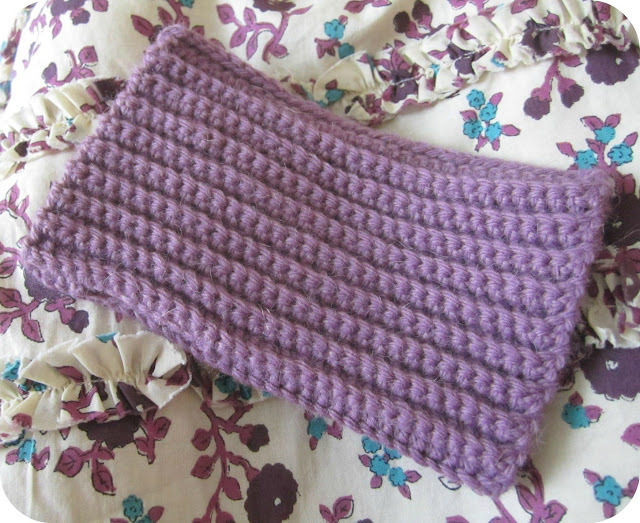 I have trouble getting patterns for warmers to fit higher up on the arm. I need mine to reach just below the elbow, and the tops simply don't stretch. I believe your technique will make a lovely upper cuff, or entire fingerless glove! Problem solved! Thank you! One small question regarding sc and dc and the patterns actual construction. It looks to me like you used UK dc, US sc as the stitch, blo of course. Have I gotten it right? Ooh! Can't wait to make a pair that WILL stretch to fit! I love them ! Am making them as well, and put a link to your blog on mine ! Thank you for the pattern !